I so LOVE that picture for the weekend cat blogging. It's so pretty. Allie - what pretty pink nails you have. Looks like you just had a pedicure yesterday. OH your NAILS are so GORGEOUS! I'm jellus. How long do they last before they fall off? I may ask for some too. I have a bit of a problem, um, well, sorta kinda, um..clawing the carpet. Ahem. Allie: *giggle* oooh thank you! They last as long as the claw lasts, so when you shed a claw (about once a month) the toenail cap goes with it. Not too terribly annoying. Thanks for playing at The Saturday PhotoHunt. You sure have nice looking nails , Allie ! LOVE the nails.... Zoey wants to know if they come in leopard?!!! Allie: *squeee! * ooooh Zoey! Leopard Print would look DIVINE on you!! 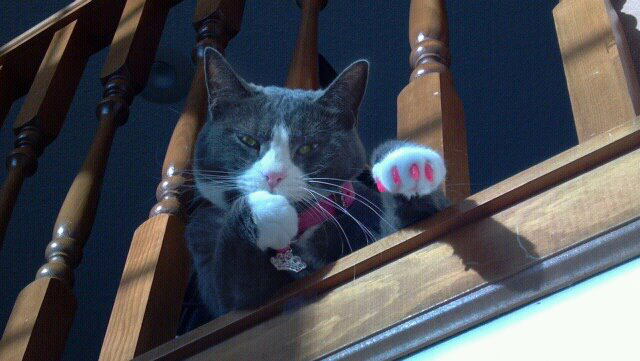 Allie, you look like you are reflecting about who you can whap with those pink nails of yours! I know a calico kitty that would love to have some pretty nails like those! I'm sorry I am laughing at Mario's comment lol!!!!!! What are you "reflecting" about beautiful kitty? Austin wants to know if he can have them in black??? Looking very reflective! Love it! She's rockin' the nail covers. Allie, I am loving your hot pink nails! Allie, you are so pretty and glamorous! Pink collar, pink nose, pink toes - you're so pretty. And you have a wonderful spot up above everyone to reflect on what a wonderful life you have.